I know… it sounds like a conflict to many. The region I call home is thought to be in perpetual summer, always sunny and the sea always glassy smooth. But there are seasons and they are very real. You can set your calendar by Hurricane Season – a season the world is far more aware of since last year’s American East Coast fiasco that hit home a little closer to the seats of power than Katrina did. But then there is Dry Season. Deep into Dry Season we find ourselves in Tick Season. Right before the rains come there is Orange Season. And then the downpours herald Rainy Season. And with Rainy Season comes Mosquito Season. About two months into Rainy Season we have Mango Season. And a little into Rainy Season we also have Crab Season when the crab holes have been flooded and the animals scuttle around roadsides with natives chasing them into buckets. Some of my early childhood memories are of me joining the pack of kids roaming the neighbourhood with 5 gallon paint buckets with strips of wood across the top. My family didn’t eat crab – as good Adventists back then we stuck to the food laws of Leviticus. But that didn’t stop me from crawling under hedges and stick-fencing with crabs at the edge of swamps with the best of them. Red shanks were never kept, seen as too small to eat and more of a nuisance than a delicacy. But the big, round land crabs with their khaki shells and bad attitudes – those were the fellas we spent rainy season afternoons chasing. Alfi was good with them. He would stalk a crab for hours, patiently waiting for it to make a move and simply follow it to the next location. He was a big goofy golden retriever and if he were human he would have been Buddhist or something – a strong pacifist, with harm to any other animal on earth seen as a sin. (Unless, of course, said animal was human or canine and decided it should get too close to myself or my brother.) I remember Alfi watching the cat hurt a lizard, chasing the cat away, and then laying down next to the lizard, the size of one of his claws, as it died. We couldn’t go swimming with Alfi around because he would lumber into the water splashing everywhere and haul us by our collars into shore and a safe depth – safe being 3 inches. But Alfi loved to watch his crabs. Thatcher was a crab killer as a pup. She’d follow and destroy even though they were about half the size of her spicy little self. In her later years she would simply watch them walk past her into the house, bored by them after 15 seasons. But now, I’m afraid, my dogs have been urbanized. We have moved out of my parents’ country home and into manicured lawns, complex rules, and twice daily walks on pavement rather than through bush. I notice more and more how little like country dogs they now are – don’t like walking on grass, hate the rain, despise other dogs. 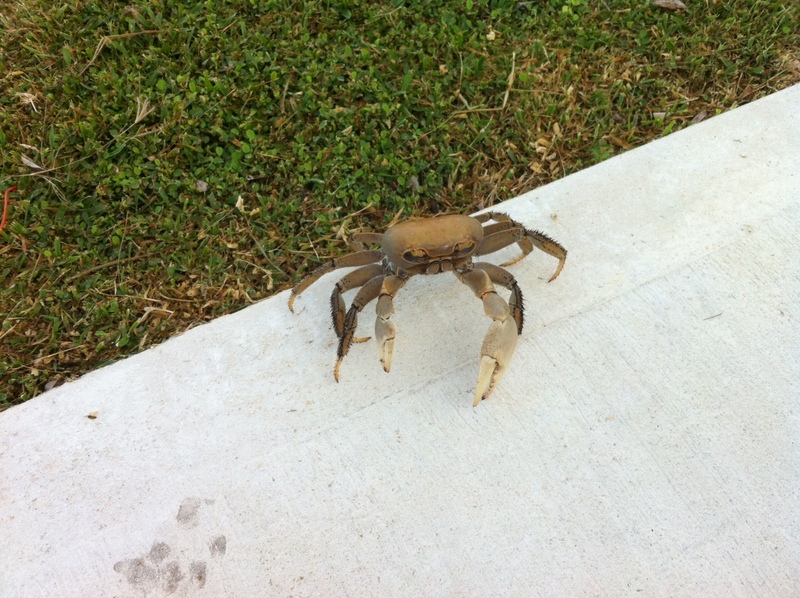 On our walk this morning this gorgeous land crab came right out in our path. Julius turned his nose up in the air and walked right past. Lola, seeing my surprise, gave him a little sniff and teased him for a few seconds. Looking up at me to see if I was satisfied, she joined her brother and began to pull me home. This entry was posted in Island of the Stream and tagged Caribbean, Cayman, crab, rainy season, shellfish by Nikki. Bookmark the permalink.